Tilted Horizons: Can't help but see RevZilla's latest giveaways. Can't help but see RevZilla's latest giveaways. 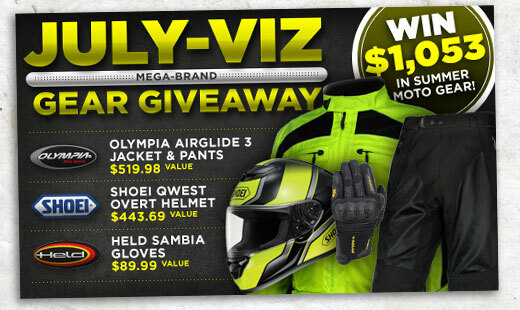 Revzilla has outdone itself this month, putting $1,053 worth of top-quality gear up for grabs! Click on over to RevZilla's July contest page to enter. The First Prize winner this month will receive Olympia Airglide 3 jacket, Olympia Airglide 3 pants, a Shoei Qwest Overt helmet, and a pair of Held Sambia gloves, all in glorious Hi-Viz. $50 Revzilla gift certificates will go to the two Second Prize winners.